So even though I know that many people think Valentine’s Day is manufactured, romantic silliness, for me, it brings to mind really great celebrations of the deep affection my family and I have for each other. So I love it. And I love you guys. In the spirit of that love-fest— even though the actual holiday was yesterday — I’m going to unabashedly share some fitness-related stuff (plus a few randoms) that makes my heart sing. Cool? I first heard it in the movie A Knight’s Tale, which makes me uncool. But my adoration of choreographed dance scenes already makes me uncool, so whatever. Now, the song is on my running playlist—and it’s very useful as a workday afternoon mood-booster, too. I joined Crunch gym just after I started my job in New York two years ago. Aside from the convenient locations (one near my job, another near my apartment) and really great classes (Marc Santa Maria’s Monday night hip-hop and Dave Norfleet’s iRide Spinning are FANTASTIC), the vibe there is a little bit funkier and more accepting than many other New York gyms I’ve visited. The gym’s motto, after all, is No Judgments. This month, they’re holding workshops and offering training specials to raise money for Augie’s Quest, a Muscular Dystrophy Association initiative to find a cure for the degenerative muscle disease ALS. 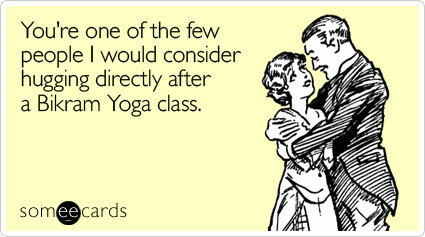 This month, the gym will give Augie’s Quest $5 for every new membership and $10 for every new personal training package. “Love Your Muscles” refers to the signs they put your name on when you donate: You can choose a muscle you love — I picked the heart — and your name goes up alongside a cute cartoon drawing of that muscle. If you’re interested in more information or want to donate, go here. Toward the end of every yoga class, the instructor asks everyone to lay on their backs, heels together, toes flopped apart, arms by their sides, palms open. Sometimes our eyes are open; often, they’re closed. We lay in this position, known as savasana (suh-VAH-snah) or “corpse pose”, and relax everything. Sounds like sleeping, you say. It’s seriously close, but so much better. Often, the poses right before savasana are challenging, and laying down and focusing only on breathing and relaxing seems like a reward. In Bikram yoga, sometimes the only thing that gets me through a rough class is the thought of how sweet the savasana will be at the end. I lay on my mat and think about how the ground is supporting me, holding me up, and how I don’t have to do anything except find little snarls of tension in my body and then let them go. Even if you’re not into yoga, try giving yourself a few minutes of motionless chill-out time after a tough workout sometime. It’s pretty awesome. When my old gym bag bit it, I tried to make do with tote bags and backpacks and the like. No good. I resisted buying a new one because I didn’t want something huge and clunky, but I needed something big enough to fit a change of clothes, my sneakers, and toys like my interval timer, my iPod, a magazine, my weight gloves, etc. Behold, Puma’s Dizzy Barrel Bag. It’s pretty great, kind of stylish, and (right now) on sale! Gym bag woes, cured. I’d love to hear what gets your heart pumping, too. Gadgets and gear? Workouts? Instructors? Personal accomplishments? Something completely unrelated to fitness but awesome nonetheless? Tell us about it in the comments section. 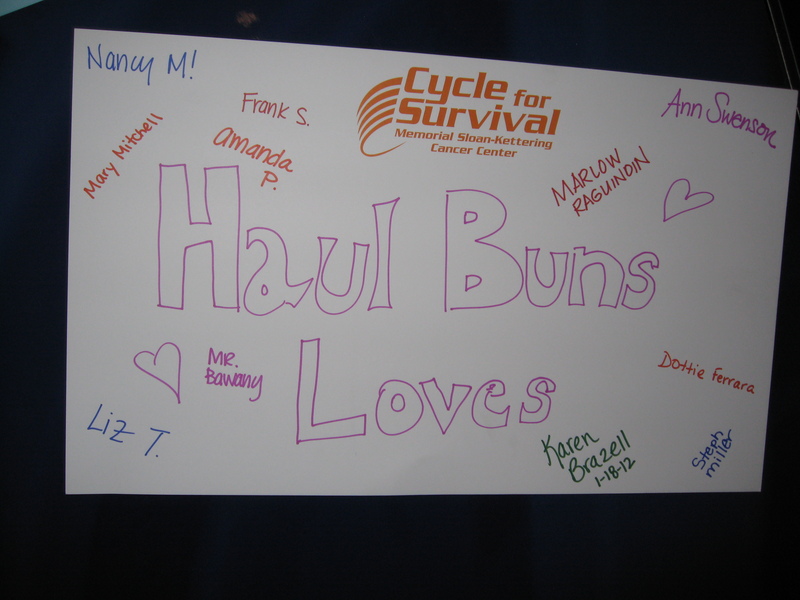 Team Haul Buns. It’s kind of a thing now. 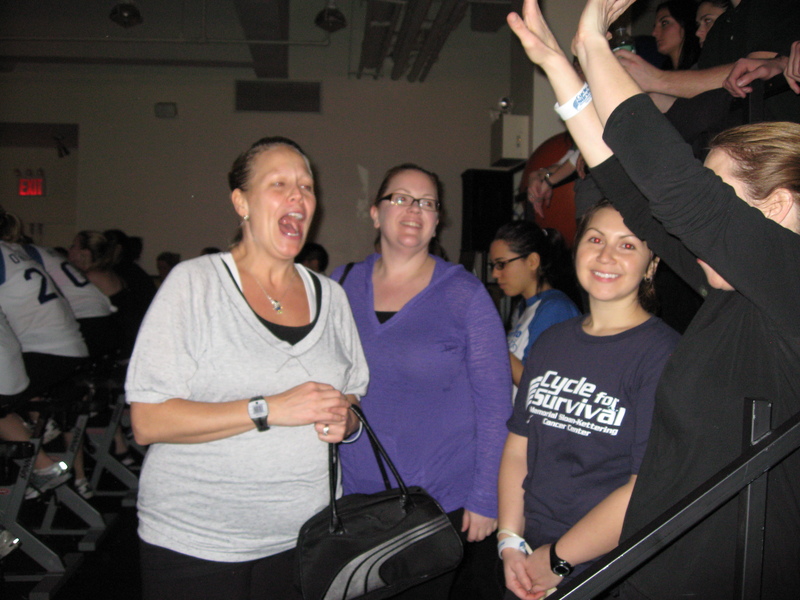 If you need proof, here’s exhibit A, taken at yesterday’s Cycle for Survival event at Equinox on Fifth Avenue in New York. 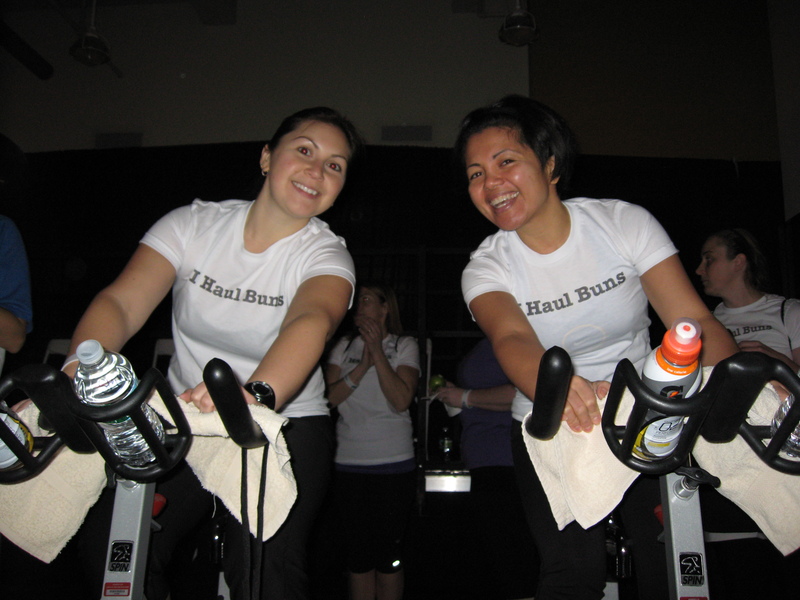 Team Haul Buns, sweaty and victorious! 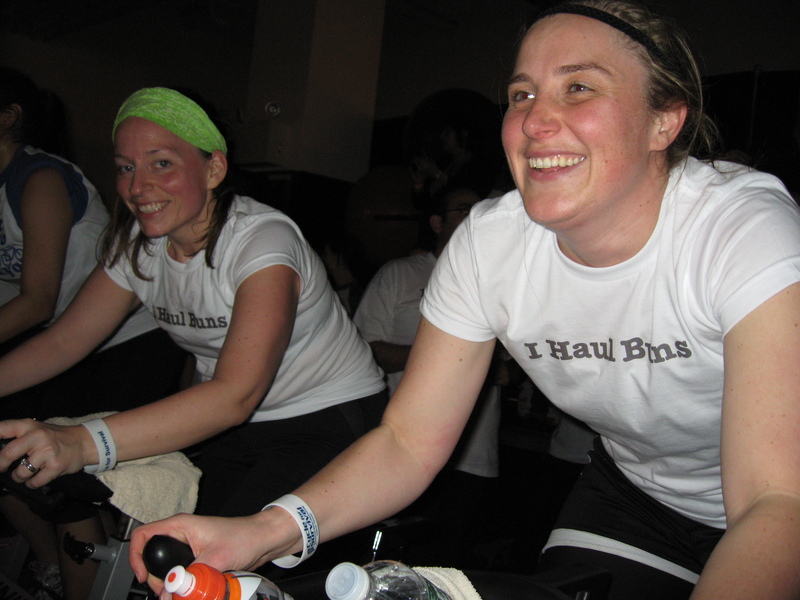 The fundraiser, started five years ago by Jennifer Goodman Linn and her husband, Dave, is a whole bunch of back-to-back Spinning classes. Teams of riders raise money that goes directly — 100 percent, every penny — to Memorial Sloan-Kettering Cancer Center to research and treat rare cancers. The Linns had a good reason to start the annual event: Jennifer was diagnosed with sarcoma at age 33. She died in July, and this year’s event was a beautiful continuation of the mission she started. It fills me with so much pride to say that the eight members of Team Haul Buns raised more than $3,000 this year and SERIOUSLY represented yesterday. Steph and Rose rode hard in the first hour. When we weren’t riding, we were cheering. We were dancing. We were taking pictures and being silly and kind of just loving the incredibly energy in the room. Erika, Tammy, Steph and Dee pump everyone up. I loved that our team was a mix of experienced Spinners and newbies — we even had a baby on board when Erika (who’s expecting her second daughter this spring) rode. This is George's "I love Spin bike seats" face. We sported team tee shirts and created a poster for people we love who’ve fought cancer. By the time it was over, we were already making plans for next year’s event. Yeah, we’re totally doing this again. 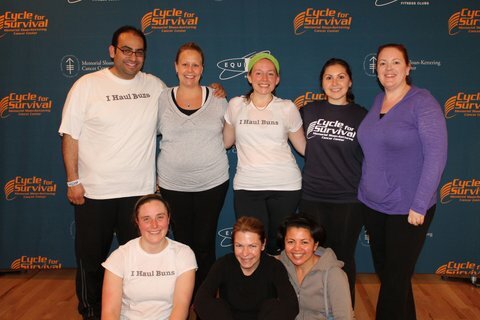 Thanks to Cycle for Survival and Equinox for such an awesome event. And SO MUCH thanks to everyone who supported our team. If you’d still like to give to this very worthy cause, you can do so here. Thanks! Ju and I rode cleanup.